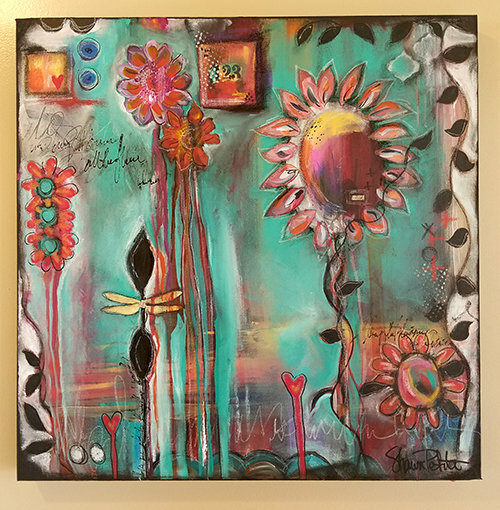 This 24x24 mixed media original has layers of paper, acrylic, oil pastel, chalk, charcoal. A beautiful depth of colors and layers. Sides are painted black, signed and sealed with a soft gloss sealer. I thought I was nearing the end of this piece and as I took the last swipe (i thought) of charcoal, I suddenly saw the path that this piece was supposed to take. Creating for me is always works that way. One single mark or stroke of the brush can change the story of a piece and stir my soul for what needs to be said in my work. Two words on this piece, "find" and "wish". Find the courage to believe to wish, to hope, to take a step toward the things that make your heart sing.